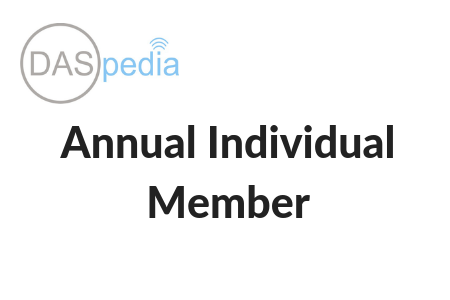 DASpedia’s individual annual membership entitles you to 1 (one) complimentary pass to all DASpedia hosted events within 1 year of date of your signup. We host 4 regional events per/year and you’re guaranteed admissions at each event. Opportunity to attend 5G Congress co-located with Realcomm’s IBCON 2019 on June 12, 2019 at Music City Convention Center in Nashville, TN. Your business cards are distributed to every attendee of each DASpedia event (You must supply your business cards or use our printing service). You will be announced as a DASpedia member to all attendees at each DASpedia event in form of visual display. Our event attendees will be encouraged to visit a common Membership display during our events. Marketing materials supplied by you will be shown at a common membership area OR distributed to every attendee. All members will receive full exposure at DASpedia.com and its social media outlets in the form of a directory listing, a press release promoting your brand, product announcements, job listings and whitepaper distribution.